The son of Walter and Billye Jean Nanny was born in Houston, Texas on August 22, 1953. He was educated in the Houston Public Schools, and graduated from Westbury Senior High School in 1971. He then enrolled in Texas A&M University where he received a Bachelor of Science Degree in Nuclear Engineering in 1975. Brother Nanny married Sheri Lynn Marble of Dallas on November 11, 1978. It was Sheri’s father, the late Brother Al Marble who inspired Mike to seek membership in the Masonic fraternity. Sheri is currently a math teacher at Robert E. Lee High School where she was named Math Teacher of the Year in 1997, and is currently the Math Department Chairman. He and Sheri are members of the First United Methodist Church of Houston. As a registered professional engineer he has worked in the power and petrochemical industries, holding positions at Brown & Root, Stone & Webster and Enron Energy and Operational Services, where he currently holds the position of Project Engineering Manager. Our Grand Master was raised a Master Mason in Gray Lodge No. 329 in Houston on May 30, 1979, where he served in various places and stations of leadership responsibility. In 1984 he became the youngest Worshipful Master at the time of his installation to serve Gray Lodge throughout its 131 years of service in the Houston area and a distinction, which still stands some 17 years after his service as Worshipful Master. Concurrent with his term as Worshipful Master, Brother Nanny served as President of the Masters, Wardens and Secretaries Association of the 30th Masonic Districts. An excellent ritualist in just about facet of Masonry, he has held a Certificate of Proficiency since 1981. He served as Secretary in 1993-94. A firm believer in the benefits of Endowed Memberships, he is an Endowed Member of Gray Lodge, Tranquility Lodge No. 2000, Mercedes Lodge No. 1010 and Fairy Lodge No. 751 in District No. 72 where he served as District Deputy Grand Master under Grand Master Leonard P. Harvey in 1989. Such has been his attachment to Fairy Lodge that the Lodge honored him with the Golden Trowel Award in 1994. In addition, he is a full member of the Sam Houston Hall of Fame. Brother Nanny’s service to Grand Lodge began with his appointment to the Executive Committee of the Sesquicentennial Commission in 1985. In addition, he served as Grand Senior Steward in 1990, Grand Senior Deacon in 1993, and as Grand Junior Steward in 1998. He has participated in several Grand Master’s Conference Planning efforts, and served as Assistant State Coordinator in 1990, 1994 and 1996 – and as State Coordinator under Grand Master R.O. “Bob” Schnell in 1993 and Grand Master Joseph W. Regian in 1997. Other Grand Lodge service includes his membership on the Finance Committee from 1993 through 1997, and as a member of the Masonic Education and Service Committee in 1998. A member of Bluebell Chapter No. 856, Order of the Eastern Star, he served as Worthy Patron in 1983-84. His receiving the Rainbow Grand Cross of Color and the DeMolay Legion of Honor reflects his dedication and commitment to the Masonic related youth organizations. 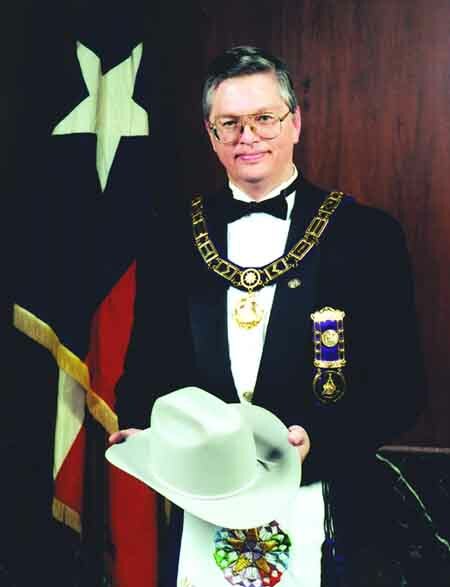 As an active member of the Houston Scottish Rite Bodies, Brother Nanny was invested with the Rank and Decoration of Knight Commander of the Court of Honor in 1985; served as Master of Kadosh of the Houston Consistory in 1993, and Venerable Master of the San Jacinto Lodge of Perfection in 1994. He has served on various degree teams, including Commander of the K.C.C.H. Investiture Team, and in recognition of exemplary service to the Ancient and Accepted Scottish Rite of Freemasonry, he was coroneted a Thirty-third Degree Inspector General Honorary in November 1999. Brother Nanny demonstrates his complete support of our Texas Masonic Family by his memberships in El Mina Shrine Temple and in Chinar Grotto. His York Rite memberships include Washington Chapter No. 2, Royal Arch Masons; Houston Council No. 1, Royal and Select Masters; Melrose Commandery No. 109, Knights Templar and Houston Commandery No. 95. He has held various offices in all York Rite Bodies and is also a member of the Gulf Coast York Rite College No. 106 in Houston. Other Masonic related activities included the Allied Masonic Degrees, Knight Masons, Red Branch of Eri, Royal Order of Scotland, Texas College Societas Rosicruciana (Masonic Rosicrucians), Red Cross of Constantine, and the Texas Lodge of Research.